Fish are the main source of the n-3 highly unsaturated fatty acids, which are crucial for human health. Their synthesis from C18 precursors is mediated by desaturases and elongases, but the activity of these enzymes has not been conclusively established in marine fish species. 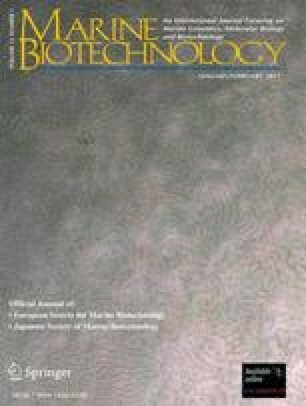 This study reports the cloning, tissue expression, and functional characterization of a sea bass (Dicentrarchus labrax L.) Δ6-desaturase and one of its splicing variants. Two cDNAs with open reading frames of 1,346 and 1,354 bp were cloned and named D6D and D6D-V, respectively. Both deduced protein sequences (445 and 387 amino acids, respectively) contained two transmembrane regions and the N-terminal cytochrome b5 domain with the HPGG motif characteristic of microsomal desaturases. D6D presents three histidine-rich regions, whereas in D6D-V, an insertion of eight nucleotides in the boundaries of exons 10 and 11 modified the third histidine-rich domain and led to insertion of a premature STOP codon, resulting in a shorter predicted protein. Quantitative real-time polymerase chain reaction assay of gene expression showed that D6D was highly expressed in the brain and intestine, and to a lesser extent, in muscle and liver; meanwhile, D6D-V was expressed in all tissues tested, but at level at least 200-fold lower than D6D. Functional analysis in yeast showed that sea bass D6D encodes a fully functional Δ6-desaturase with no residual Δ5-desaturase activity. This desaturase does not exhibit a clear preference for n-3 versus n-6 C18 substrates. Interestingly, D6D-V is a nonfunctional protein, suggesting that the C-terminal end is indispensable for protein activity. The online version of this article (doi: 10.1007/s10126-010-9264-4) contains supplementary material, which is available to authorized users. This work was partly supported by Marine Genomique Europe, by Axe1 “Génomique et Chimie Bleue” Europôle Mer, and by IFR 148 ScInBioS. The authors thank Erick Desmarais for his assistance in gene sequence treatment. E. Santigosa was supported by a postdoctoral fellowship from the Fundación Alfonso Martin Escudero (Spain).